Unique Moments Photography of Gig Harbor Washington provides all day coverage for our wedding packages and for good reason. What if its raining at 2 PM when its time for formals. What if it stops raining at 6PM and your photographer is long gone because your time is up. Being on a clock simply DOES NOT WORK for wedding photography. Lots of things can and will happen that mess up a timelines. Thats just weddings 101.It happens. We are there all day so we get it done on schedule or off schedule. You have to be able to work with what Mother nature is going to provide on the day of your wedding. This image is no exception. 1 PM, not a cloud to be found and it was so bright that you had to fight of the sun by squinting. The shadows in everyone's eyes were terrible. 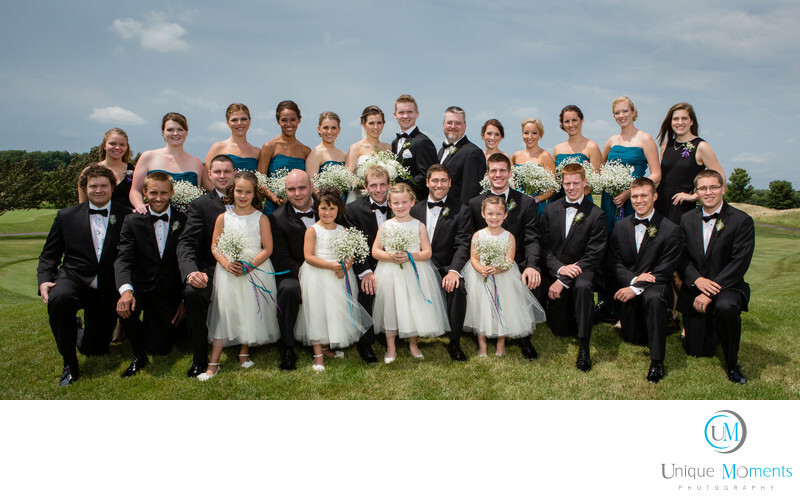 We had to use 2 powerful off camera flash strobes to soften the shadows on this group of 27. Natural light was not going to work. We come prepared at every wedding we photograph with a lot of equipment because you never know what mother nature is going to provide on the wedding day. Bright sunny days are just as difficult to work with at 2PM as rainy days when your shooting around showers. When you hire unique Moments Photography, you hire a company that knows how to combat mother nature and the obstacles that can prevent Great images. Location: 3303 Vernhardson St, Gig Harbor, WA 98332.